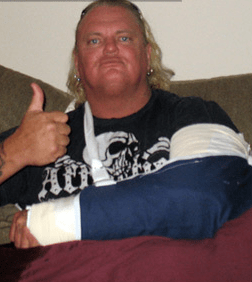 WWE wrestler Gangrel (real name David Heath) was rammed by an oncoming car while riding his motorcycle in Burbank‚ CA. Gangrel tells news reporters that he was turning a corner when he was struck. The wrestler sustained a gruesome elbow injury‚ where his bone looked dislocated. He was rushed to the hospital and diagnosed with a fractured elbow. So far‚ he seems okay. His bike needs an estimated $4,000 in repairs before the two set out on the road again. Gangrel may be able to have his repair bill and medical bills compensated if he can prove that the driver of the car was at fault. If you or someone you love has been injured in motorcycle accident in Los Angeles County‚ contact the California motor vehicle accident attorneys at the Jurewitz Law Group. Call our San Diego office at 1-888-233-5020 to learn about your legal rights and options.